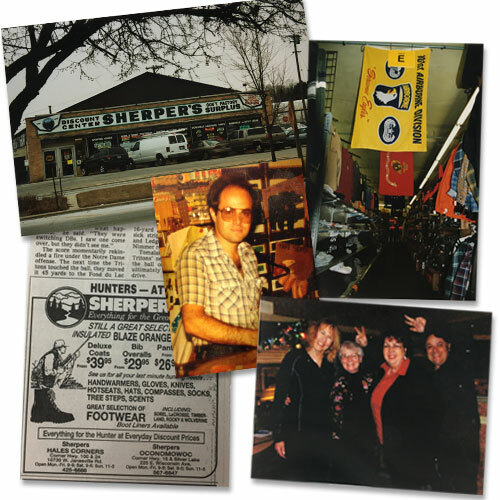 Sherper's is a 4th generation family owned and operated business. Sam Scherper started the Sherper's business as Adam's Hat and Shirt Company in October of 1935. It was a men's haberdashery selling formal menswear. The first location was at 4th and Wisconsin Avenue in downtown Milwaukee. In the early 40's we were re-incorporated as Sherper's Inc. As you might notice the store is spelled "Sherper's" where our last name has a "C" in it (Scherper). The reason for this is when Sam went to go buy a sign for the store, he only had enough money in the bank for the size of sign that could fit 8 letters, so he dropped the "C" from the name so that he could afford the sign. During WWII we went from being a men's haberdashery to selling military uniforms and footwear. After WWII, Donald and Boyce (Sam's son's) came home from the war and joined the family business. 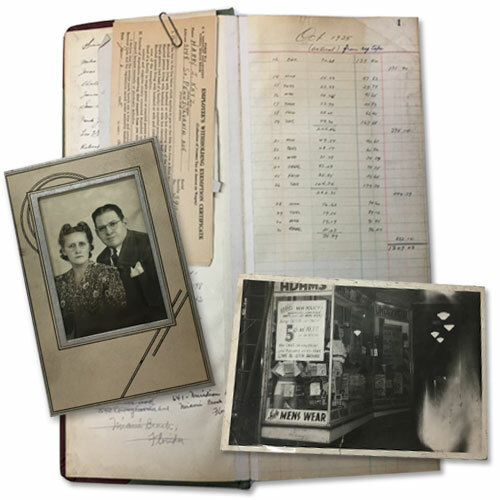 Donald and Boyce started buying government and factory surplus at auction and selling it in the stores, which began our transition from a haberdashery to an army/navy surplus store. In 1952 we opened up a second store on 27th and Forest Home Avenue on the south side of Milwaukee. Donald ran that store while Boyce ran the downtown store. In 1957 we closed the 4th and Wisconsin Avenue store and opened a new location in Tess Corners just west of Hales Corners. Six months later we moved from that location to Hales Corners at the corner of Highway 100 and Janesville Road just south of our current location in Hales Corners. In 1958 we closed the Forest Home store and Donald, Boyce, and Sam all worked at the Hales Corners store. From there we experimented with a lot of different products. We sold a lot of farm clothing, paint, army/navy surplus, and even surplus jet engines that we put on the corner and actually ended up selling to some drag racers who used them in their cars. Donald and Boyce really made Sherper’s a staple in the community as a place to buy hard-to-find goods at a great value. They were very savvy buyers and they passed those savings onto our customers. In the 1960's we entered into the camping business selling pop-up trailers. In 1974, Gary (Boyce's son and the current owner) joined the business. Two years later in 1976, Gary's brother-in-law Dave came into the business with Gary's sister Gale also working some in the business as well. At the same time, Boyce took over the ownership of the business from his father Sam. 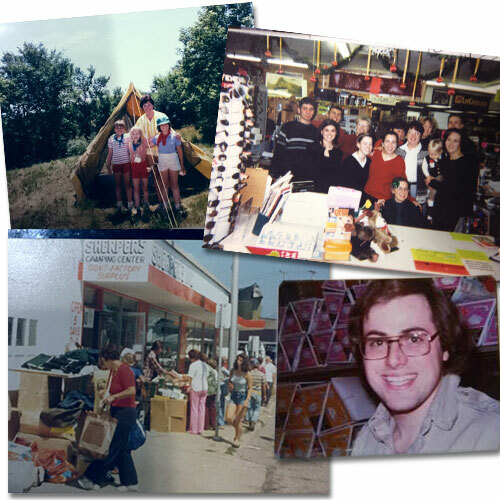 A year later in 1977 we opened up a second location in Oconomowoc, with that store still operating in the same location today. In the late 70's and early 80's, we continued to sell army navy goods and factory surplus, while continuing to grow the outdoor sporting goods business in the camping and hunting areas. In 1987 Gale joined the business full time and in 1989 Gale and Gary took over ownership from Boyce. Gale and Gary really took the business to a new level during this time. They continued to concentrate on off-price and surplus goods, but they also started to expand into more outdoor sporting goods focusing more on camping, hunting, and paddle sports. In 2003 the Hales Corner location moved into a new building a few hundred feet north of the Highway 100 and Janesville Road location to the current Hales Corners location. In 2008, Rob (Gary's youngest son) came into the business. They continued to focus on all of the existing categories while growing their tactical business which fit in nicely with the army/navy roots. In 2011, Sarah (Rob's wife) graduated school and came to work for the business. In 2015, Nate (Gary's oldest son) came into the business. In 2018, Rob and Nate announced they were opening a third store in Port Washington. This location is set to open in July along with a kayak, canoe, and SUP rental shack located steps away for the marina in Port Washington. Today we continue to look for new categories and areas to grow the business, but it all goes back to Sam, Boyce, and Donald's original vision of finding hard to find products at a great value so that we can offer unique items at good prices. We are not just an army/navy surplus store, a discount store, or an outdoor retail store. We don't force ourselves to fit any one mold, but instead we assort each of our stores to what our customers are looking for that they can't find elsewhere and at the low prices we have always offered.